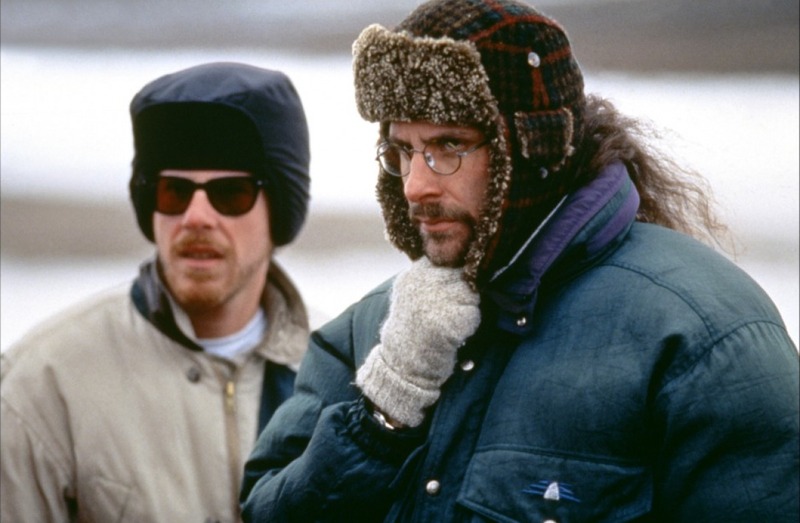 In 1996, directors Joel and Ethan Coen achieved their first mainstream success story with a project that would take them back to their homeland: the snow­ covered sprawl of Minneapolis, Minnesota. Their quirky blend of humor and violence had evolved through their previous films, coalescing into an artistic persona that tapped directly into the cultural zeitgeist of the Clinton era. They collected a mix of sensational crime stories and urban legends from around the area, and threw them together into the proverbial wood chipper to create an undeniable masterpiece of atmosphere, tension, and pitch­ black comedy called FARGO. Perhaps because the Coens know their subjects so well, they can sustain an exaggerated comic tone that nonetheless manages to project an air of authentic sincerity. This is thanks in large part to the performances by FARGO’s cast, who seem to be fully aware of the film’s significance and are thus applying career­best efforts. As the conniving salesman Jerry Lundegaard, William H. Macy plays to his eccentric physicality in a career­best performance, creating a sad­sack, emasculated schmuck cursed with the awareness of his own incompetence. In a desperate bid to dig himself out of a mountain of debt and bad business decisions, he enlists the help of two bumbling criminals to kidnap his wife and split the ransom money paid by his wealthy father-­in-­law. Steve Buscemi and Peter Stormare deliver star making turns as the two incompetent crooks, Carl Showalter and Gaer Grimsrud. Showalter is the oily-­haired brains of the operation­­ a manic, motor­mouthed antagonist who the locals can only describe as “funny­-looking, in a general kind of way”. Far more imposing is his calm and collected counterpart, the bleach-­blonde Grimsrud, who has a nasty propensity for sudden, cold­-hearted violence. This interesting pair possesses a dynamic that’s reminiscent of the Coens’ own diametrically-­opposed cinematic influences. If Buscemi alludes to the slapstick comedy of Buster Keaton, then Stormare is straight out of a hard-­edged Sam Peckinpah picture. While the ensemble nature of FARGO’s storyline might suggest otherwise, the film truly belongs to Frances McDormand and her Oscar­ winning performance as the plucky, pregnant policewoman, Marge Gunderson. She adopts a heavy Midwestern accent that’s endearing and infectious– the minute she opens her mouth to speak, you can’t help but fall in love with her even as you try to contain your laughter. In a world of scheming, comically­-incompetent male types, Marge excels with a very simple agenda: use the facts to find the bad guys. She’s a refreshingly insightful protagonist, offering some of the film’s most poignant moments in her obtuse cadence and simple musings. Roger Deakins returns as the Director of Photography, rendering the 1.85:1 35mm film frame in bright swaths of blinding white and suffocating black. This monochromatic color palette is accentuated by vivid splashes of crimson red, which recur throughout the film like bullet wounds in the otherwise­-pristine landscape. Natural lighting schemes and dolly-­based camerawork help to create a sedate, observational tone that places the emphasis on the cast’s off­-kilter performances. Despite its straightforward visual presentation, the Coens manage to cultivate a noir vibe reminiscent of their 1984 debut, BLOOD SIMPLE.­­ especially during similar sequences that both feature murder on an isolated country road. Editing once again under their pseudonym Roderick Jaynes, the Coens infuse the film with a languidly succinct pace that complements the film’s deadpan sense of humor while injecting a sense of gravitas that sustains returning composer Carter Burwell’s iconic, brassy score. The theme to FARGO, borrowed from an old Norwegian folk song titled “The Lost Sheep” and headlined by mournful strings, injects the proceedings with a confident assertion of (quote, unquote) “importance”­­ a pretension that would sink most films, but elevates FARGO into the realm of transcendent cinematic experiences. FARGO is usually the first film cinephiles go to when trying to describe the essence of what constitutes a “Coen Brothers” film, as it marks a convergence between the crystallization of their particular artistic identity and the widespread embrace of mainstream audiences. Like many other iconic Coen works, a great deal of FARGO’s humor stems from a playful fascination with the absurdity of the mundane. Whereas most filmmakers prefer to explore the people and stories of exciting cultural epicenters like New York or Los Angeles, the Coens are primarily interested in Middle America. This manifests in protagonists who belong firmly to the common class, the prominent inclusion of Americana­inspired imagery, and frequent references to the Bible. With FARGO in particular, these fascinations coalesce into the recurring appearance of fast food­­ every other meal comes from an Arby’s or McDonald’s, reflecting the culinary tastes of 90’s­era flyover country. The outsiders perspective that the brothers bring to their work is doubly­present in FARGO, with McDormand’s maternal policewoman being a figurative outsider in a violent, male­dominated profession, and also with Buscemi and Stormare’s inept crime duo being literal outsiders­­ foreign agents intruding on a lifestyle that’s not their own, represented musically by their taste for punk rock when the world around them listens primarily to honky­tonk country tunes. In a way, the Coens themselves are outsiders within their own art form­­ they’re quick to pop the bubble of cinema’s inflated sense of self­importance. FARGO pursues multiple avenues in this regard, the most high­profile of which is their decision to falsely portray the film as a true story. While we all know better today, audiences were easily roped into the fiction, to the extent that some even made the journey out to Minnesota themselves in search of Showalter’s forgotten briefcase of money, still buried somewhere out there in the snow. The Coens took advantage of our collective tendency to blindly accept art as initially marketed to us; after all, it has to be based on a true story if it says so on the poster, right? While cynical studio marketing departments have used this same technique in recent years, none of their efforts have come even remotely close to the potency of the idea’s use in FARGO. Joel and Ethan’s anti­genre convictions lead them to further subvert the expectations of the crime drama. For instance, McDormand’s protagonist isn’t even brought into the narrative until the second act. Furthermore, they stage the death of Jerry’s kidnapped wife­­ a major character, integral to the plot­­ entirely offscreen, a technique they would use again a decade later in another anti­genre masterpiece, NO COUNTRY FOR OLD MEN. The brothers also sabotage the seriousness of their crime narrative at every turn by incorporating exaggeratedly comical minor characters. This refusal to play by the cinematic rule book has made the Coens iconoclasts in the eyes of Hollywood, but it’s also directly responsible for their distinctive appeal, which continues to fuel their success in spite of the occasional misfire. FARGO was the Coens’ first true commercial hit, but it fared even better with critics, who lauded it with Best Directing honors at the 1996 Cannes Film Festival as well as their first Oscar­­ a win in the Best Original Screenplay category. It is routinely cited as one of the best films of the 90’s, but perhaps the most significant prize would come in 2006, when the Library of Congress deemed FARGO worthy of inclusion into the National Film Registry in its first year of eligibility­­ thus assuring its place in the canon of great American films. There have been many attempts to replicate FARGO in the years since its release, but none have been able to reproduce it’s bizarre, macabre charm. The success of the Coens’ sixth feature film established them not only as an immediately identifiable voice in mainstream American cinema, but as a cultural force that would be appreciated and studied for a long time to come. FARGO is currently available on high definition Blu Ray from Twentieth Century Fox.